I opened my review of My Life as a Dog this morning by professing my love for coming of age dramas, and what do you know, the other title I had to review today is another coming of age film. What’s that old saying about buses? Rather than telling a period tale of burgeoning adulthood in rural Sweden though, Melody (a.k.a. S.W.A.L.K. – what a hideous title!) 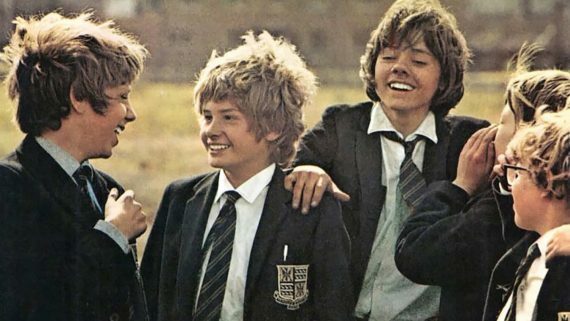 is set in present day (early 70s) London and follows Daniel (Oliver himself, Mark Lester), a middle class boy starting at a mixed comprehensive school with a range of likeminded young rascals. Daniel befriends a naughty but likeable lad called Ornshaw (Jack Wild, also of Oliver! fame). The two are from very different backgrounds, which cause a few issues, but generally they’re inseparable as they get into mischief at school and home. That is until Melody (Tracy Hyde) comes on the scene. Melody is a good natured dreamer who lives in a council flat with her mother, grandmother and father, although the latter spends more time at the pub than home. Daniel falls madly in love with Melody when he spies on her dancing at school. He stalks her (in a well meaning 12 year old sort of way) until eventually Melody falls for his charms too. All is peachy with them, but Ornshaw isn’t too happy about his friend being otherwise occupied so friction develops between the two boys and the couple get in trouble with their family and the school when they demand to be able to get married now, not in the future as the law demands. So it’s very much a tale of ‘puppy love’, of children, or at least not-quite-adults, falling for each other and not quite knowing what to do about it. As I said with regards to My Life as a Dog, that subject matter can be a recipe for disaster, but again it’s handled sensitively and effectively. It’s difficult not to fall for the pair’s charms yourselves either. Daniel is so innocent and well-meaning, even when he’s getting into trouble, and Melody has an inner and outer childish beauty that shows well on camera. The two make an exceptionally effective pair, which helps make the film very sweet natured. I particularly liked the scene where they finally make a proper connection. The two are sat alone in the music room, waiting for their lessons, and Melody starts to play Frère Jacques on her recorder. Daniel jumps straight in on the second line with his cello and the two play an impromptu duet which plays out like a quietly intimate love scene, minus the ick-factor you’d get using children of that young age. As you’d image, Melody is more sentimental than My Life as a Dog and does threaten to get quite syrupy at times. For the most part though, helped largely by the portrayal of all the kids as rambunctious and full of hormones, it feels fairly natural. The mischief, name-calling and naïve talk of love and relationships provides a lot of humour too and it’s a very enjoyable watch because of this. As such, it’s an effective celebration of youth. The freedom, adventure and fun of being a kid is infectiously well presented. The film also has a lot to say about the class divide in the UK. This can be a little too blatant, with scenes regularly intercutting between Daniel’s middle class home and Ornshaw or Melody’s working class ones. For example we jump from Daniel sat at a dinner party in over the top evening wear, to Melody sat on the sofa with her mum and grandma watching upper class people on a show on TV. Although this gets a bit heavy handed, I did like the way the young characters handled their differences with a naive insensitivity on Daniel’s part to begin with turning to understanding and full acceptance as it goes on. It becomes a non-issue to them eventually and the film thankfully doesn’t overplay this fact. Something I did feel was overplayed though was the music. The Bee Gees provided the soundtrack and although there are a couple of good tracks in there (‘To Love Somebody’ is a classic), I found the music rather intrusive over the otherwise small and intimate film on screen. There are far too many montages with overly produced and often rather dated songs blaring over the top for my liking. The finale gets a bit ridiculous too as the children get their own back on the teachers and parents in spectacular fashion. It’s fun, so just about gets away with it, but felt like an attempt at if…. style anarchy in an otherwise grounded story. The final shot is beautiful though, pulling us back to the mood developed previously. Overall it’s got its flaws then and is maybe a little over sentimental and slight, but it’s hard not to fall for the charms of the lead characters. It’s a sweet and enjoyable celebration of childhood that will delight anyone willing to let it into their hearts. Melody is out on 8th May on Blu-Ray & DVD in the UK, released by Studiocanal. I saw the Blu-Ray version and the film looks and sounds great. Special features include new interviews with Lord David Puttnam, Sir Alan Parker, Waris Hussein and Mark Lester. These are fairly in depth so provide a solid set of extras that are well worth a watch.